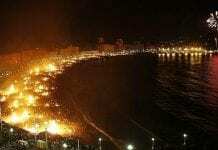 SPAIN’S beaches will be ablaze tonight (June 23) with a more fiery sort of fiesta. It’s St John’s Eve – more commonly known in Spanish as El día de San Juan and it’s back for another year. The evening is a celebration of the feast day of St John the Baptist. The Bible states that John was born six months before Jesus, so this is why his feast day is six months before Christmas Eve and coincides with the summer solstice. 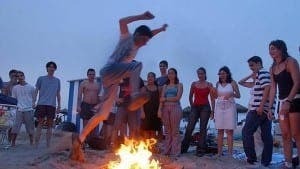 This event classically represents all the glory of a Spanish fiesta with a twist – a celebration with drink, food and friends while dancing and jumping over roaring bonfires on the beach. It is a memorable day during the Spanish calendar, one that should definitely be experienced if you get the chance. The magic of this night is epitomized through two elements – fire and water, which are used to cleanse the body and soul. 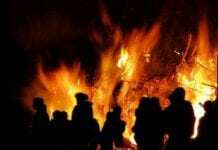 Tradition has it that if you jump over a bonfire three times on San Juan’s night, you will be purified and your problems burned away and by jumping in the sea at midnight, evil spirits are supposedly washed away. People wash their faces and feet three times in order to be granted three wishes and for a happy twelve months thereafter. 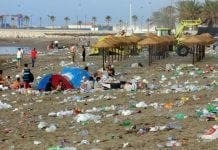 Traditionally, the Spanish didn’t visit the beach until this day each year. So if you fancy a midnight stroll and the opportunity to experience a surreal and magical evening, head down to the Costa tonight. You might be in for some luck.